Investing in new residential or commercial windows and doors is more involved than buying new furniture for the living room. Windows are intended to last for decades. In the best-case scenario, they require minimal maintenance, make the home more energy efficient, and add something to the visual appeal of the place. Always take your time when it comes to finding the right replacements and the right installation company to do the job. Finding the best companies involves using online resources to determine what past customers are willing to share about their experiences. Google and Homestars are among the most reputable places to find reviews. Homestars employs a scale of 1 to 10, while Google uses a scale of 1 to 5. On both platforms, a higher number indicates greater customer satisfaction. So what is the best Toronto windows company in Toronto? Here are six companies that you will want to consider before settling the one that’s best for your project. Take your time and it won’t be difficult to identify the house window replacement companies that deserve your attention. Canadian Choice Windows and Doors is one of the home window replacement companies serving the Toronto area that offer senior discounts. You an receive a 10% discount on qualified purchases. Depending on the number and style of windows you want to replace, that can lead to a significant savings. The company has a number of satisfied customers, based on online reviews. Google users rate the company at 4.1 while the Homestars rating currently stands at 9.4. Part of this is due to the variety of window and door options the company offers and installs. Couple that with zero percent financing for qualified customers and you can see why they do have such good standing in the community. Canadian Choice Windows & Doors is considered one of the top window replacement companies for any residential customer who wants vinyl windows. Along with the many styles, the company takes customer satisfaction seriously. You can expect a complete inspection of all new windows before the installation crew considers the job done. If there’s any issue due to an installation area, it will be corrected at no additional cost. Many customers note that the customer support team is quick to answer questions and resolve any minor issues that may arise. This is comforting to homeowners who may have experienced some difficult with other professionals in the past. The combination of quality vinyl windows, potential discounts, and the variety of window styles and designs makes Canadian Choice one of the best window companies in the area. With a Homestars rating of 9.8 and a rating of 4.9 from Google users, there’s no doubt that Omega Windows and Doors should be on your short list of the best windows companies in the GTA. Reviews give the company high marks in terms of service, efficient installation, and the quality of their work. Many reviewers also note that the staff are there to answer questions even after the installation work is completed. Omega offers warranties and guarantees for the windows and doors as well as their work. You can expect support to continue for as long as you maintain some sort of service contract with them. On the front end, they offer free estimates to any property owner who is thinking of investing in new windows and doors. Like most commercial and residential window companies, Omega offers a selection of materials that are sure to work with your property. If you prefer wood, they offer great options. You can also invest in metal or vinyl windows for the replacements. The best house window replacement companies understand that customer needs vary and will seek to provide options that meet your needs. The company only offers Energy Star qualified windows and doors. When it comes to glass, they provide options that are shatter-proof. That’s important for security as well as safety. If you can think of the design, Omega has it on hand. They will also work with you to create custom designs. That’s a feature that not all window companies in the area offer. Some customers have noted issues with obtaining codes for making additional keys or having to wait for service personnel to resolve issues with sticking doors. Remember to ask about any service or function issues that you’ve experienced with other companies and find out how Omega deals with those types of problems. Ratings and reviews can tell you quite a bit about any of the window companies in the GTA. Toronto Doors and Windows has an impressive Homestars rating of 9.9 and a solid rating of 4.4 with Google users. The window designs they offer are suitable for every area of the house, beginning with attic windows all the way down to different window designs for the basement. Past customers note that the company offers competitive quotes and the actual cost ends up being close if not exact to the quoted pricing for materials and labour. The company also provides guarantees to go with the manufacturer warranties. Even after the warranties expire, it’s possible to secure a service contract that includes inspections and other troubleshooting on an as-needed basis. Among the window and door companies in Toronto, Toronto Doors and Windows is noted for following up with clients weeks and months after the installation project is completed. This is true even if the customer does not opt for any type of service contract. As one of the best window companies in the area, they carry all the designs you would expect. That includes bay windows, bow windows, awning windows, and standard single and double hung window designs. All materials, including the window glass, meet or exceed current provincial and national standards. This ensures they are eligible for rebates under Canada’s current energy programs. The company is open six days a week, something that is not ture of all window companies in the GTA. This makes it easier for customers to arrange site visits for consultations and quotes. Free quotes are provided with no obligation. Customers are advised to ask specific questions about customization costs if one or more of the windows are not quite the same dimensions. It’s hard to find a company with a 5 rating on Google, but Total Homes Windows and Doors manages to merit one. Their Homestars rating is nothing to be ashamed of either, coming in at a healthy 9.9. Customers tend to agree that the level of care taken with everything from the initial call to support after the installation contribute to these high ratings. Like other top Toronto windows companies, Total Homes offers a full range of window designs as well as all sorts of options for exterior doors. With styles in all sorts of price ranges, it’s possible for the customer to choose new doors and windows and still remain within a modest budget. The fact that the doors and windows are typically eligible for rebates makes them all the more affordable. If you need more than one window style, the company is happy to comply. You can select picture windows for the living and dining rooms, invest in fixed casement windows for the kitchen, and maybe use single or double hung windows for the rest of the house. Custom sizing for older homes is not a problem. Expect support from the moment you receive your free quote until the installation is finished. Even after that, the team is happy to honour all terms related to the warranties and guarantees provided at the time of the installation. Over the years, EuroSeal Windows has developed a reputation as one of the most reliable residential window companies in the area. One of the reasons for that is their proprietary GreenStar™ window designs. More than two years of development and testing went into this brand before it was made available to the public. As one of the best window companies in the area EuroSeal offers a full line of window styles suitable for home or commercial structures. Their doors are also noted for durability and beauty. This is especially true for their sliding doors, as well as exterior steels doors that can be coated or covered to imitate the look of wood or other materials. Google users rate the company with a solid 4.4, while EuroSeal’s current Homestars rating is 7.8. Most users are happy with the quality of the work itself and find they have plenty of choices for window and door designs. Clients frequently point to the knowledge and skill level of the EuroSeal team, ranging from the initial contact and quote all the way through to reaching and interacting with customer support personnel. The combination of attention to detail, a well-established reputation, and the variety of designs and styles to choose from make EuroSeal one of the top window replacement companies in the GTA. Their 40+ years of experience definitely make them worth calling. As an Energy Star partner, Pella Windows and Doors offers products that are among the highest quality in the province. You can depend on sturdy construction as well as a beautiful appearance. The range of styles meets or exceeds what you would expect from one of the best window companies in the area, and the designs are suitable for homes of all types. Pella offers windows made using wood, fiberglass, or vinyl. All the more common styles are available, ranging from single and double hung to awning and casement windows. Patio doors are among the more popular offerings, with sliding, folding, and hinged designs on hand. If you need something new for the front or back entry, Pella has an impressive range of steel, wood, and fiberglass doors to consider. Homeowners who want new doors and windows but are not sure what styles would work appreciate the help provided by the Pella staff. As one of the best window companies in town, Pella is happy to help. At the time of the initial visit, the representative can provide suggestions based on the home layout and general design. This is especially helpful if the homeowner never cared for the original windows and would like some help in selecting something different. Pella enjoys an 8.4 rating at Homestars, definitely placing it among the best window and door companies in Toronto. Google reviews currently indicate a rating of 3.9. Customers tend to rate Pella as one of the best Toronto window installation companies for the professionalism of their personnel. From the individuals who conduct the initial assessment and develop a quote based on the customer’s preferences to the customer support team that helps with any questions or concerns, customers note that everyone is polite, knowledgeable, and willing to listen to whatever the client has to say. Some customers have reported issues after the installations were complete. In most cases, Pella was able to correct the problems to the satisfaction of those customers. Combined with the initial positive impression and the quality of the doors and windows, Pella continues to be among the top window companies in the area. When you ask your friends “do you know someone who offers the best window replacements near me?” be sure to ask about these six companies. You’ll find that many of the people in your social network will be familiar with these Toronto windows companies. They may have purchased their new windows from one of them and can provide first-hand details about their experiences. Take what your friends can provide in the way of information and remember to do your own research into all the window companies in the area. 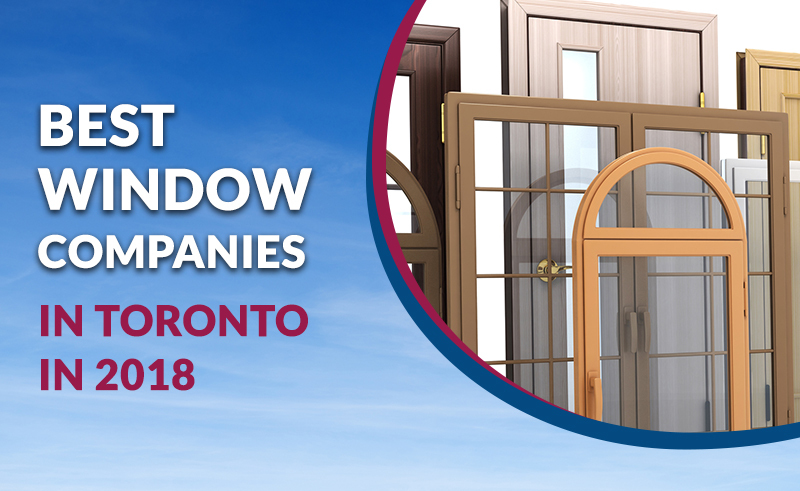 Doing so will help you see what each of the Toronto window installation companies have to offer, how the different top window companies compare, and ultimately decide which one is worthy of your business.